Easy, super crispy, and freezer friendly, these tender chicken nuggets (with sweet and spicy dipping sauces) taste 10x better than store bought! Chicken nuggets bring out the kid in all of us! They’re crispy, tender, and absolutely delish dunked in tangy honey mustard or spicy ketchup sauce. Coated in crunchy panko breadcrumbs and fresh Parmesan, these little nuggets are almost too adorable to eat! They’re freezer-friendly, too! Bake them up, place in a resealable bag and freeze. Pop ‘em in the microwave for a few minutes to warm them up. Kids will love ‘em, and adults will gobble ‘em up right alongside the kiddos! You can also make the sauces a few days ahead of time. Need some tips for keeping weeknight meals quick and easy? Read on! • Make a list of meals to make in the coming week! Consider 1-2 days for leftovers, if you think there will be any. Feeling uninspired for ideas? I’ve got you covered. • Take stock of what you already have in your pantry, fridge and freezer. Whatever you need for each recipe, write it down, organize foods by category (Fruits, Dairy, Frozen, etc. ), and get shopping! • Fast meals are made slowly… as in with your slow cooker! That electric workhorse isn’t just for hearty winter stews… it’s great for pulled pork, chili, pot roast, baked potatoes and roast chicken! • Prep, package and freeze as many ingredients as you can for the coming week. Or, cook your meals ahead of time, freeze and pop in the oven before dinnertime! Preheat oven to 450 degrees F. Spread breadcrumbs on a rimmed baking sheet and bake until golden brown, 5-6 minutes. Once mostly cooled, transfer crumbs to a shallow dish. Stir in Parmesan, salt and oil; mix well. Honey Mustard: Combine 3 tablespoons Dijon mustard and 2 tablespoons each mayonnaise and honey. Spicy Ketchup: Combine 1/4 cup ketchup, 3 tablespoons spicy chili sauce (such as Sriracha), and 2 tablespoons mayonnaise. This post is part of the BlogHer Dinner, Faster editorial series, made possible by Land O'Lakes. Our house LOVES chicken nuggets and these we’ve gotta try. Thanks for the recipe! Thanks for the heads up, Christina! Mmm, these chicken nuggets look SO good + i love the dipping sauces. Want!! Thanks for visiting my blog – it has been fun checking out yours…I am getting lots of dinner ideas!!! these chicken nuggets are perfect since you bake them love that! …and the dipping with ketchup sriracha mayo love! These look so good, Georgia! Love the dipping sauces! I love that you were able to get them crispy in the oven. Love these. And the sauces are so great! Ohh, I love that sriracha dipping sauce! These look great for everyone! Chicken will always be just as good as we were kids. This food always brings out the childish side of me. And I love the honey-mayo-dijon dipping. Love these baked chicken nuggets! They look so golden brown and crispy. I love baking chicken nuggets! These look delicious. I haven’t tried freezing them before – that’s a great idea! Never even thought about freezing them – what a great idea! These are absolutely wonderful! 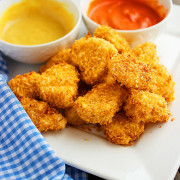 Can’t wait to make these for my grandchildren…a much healthier version of chicken nuggets!!! Thanks for sharing! I never grew up and thus still LOVE chicken nuggets and will til my dying day. The crispier, the better! I almost think I love chicken nuggets so much because of all the sauce opportunities.. I’m a condiment FREAK! That dijon spread looks ALLL kinds of good to me, and the sriracha one looks spicy awesome! Georgia, I love how you added the panko here. Delish! Those are SOO crispy, they look fried! Great! These look so delicious, Georgia! I can’t wait to make these for Ryan…and one day for our little ones. I love the panko. What a healthy alternative! Thank you for sharing! I hope you are having a lovely week! Love homemade chicken nuggets! It is one meal my son loves to help make with me! Ooooo, Sriracha and chicken nuggets, you just gave me my all time fav snack! Looks delicious..
Amazing! Love that this is freezer-friendly! Jason would be thrilled – he is all up on freezer foods since he doesn’t cook when he’s away at school! OMG – Sriracha ketchup!! We will be trying these. oh yum. dipping sauces are my reason to eat chicken nuggets, and now it looks like i have several great options. yum! A wire rack around the same size as the baking sheet you’ll be using is best. Yes, it can be a cooling rack as long as it’s oven-safe. Yummy! I am hosting a Superbowl party and these would be perfect for our “hot food” spread! I love the dipping sauces as well! Omg…these are perfect. I`m definitely trying this! Can you substitute a different cheese in place of the parmesan? It’s the only ingredient I don’t have on hand right now! No worries, you can just leave it out. My daughter said these were the best thing she has ever eaten and mom and dad thought they were amazing too….so good!! My husband also raved about the Siracha mayo! Made them a few weeks ago and making them again tonight. Thanks for the great recipe! I in finding it very bothersome to inform the reality then again I’ll certainly come again again.